“The gloomy forecast did not deter our group, as 7 of us set to explore the upper portion of the Sigurd Creek trail. Driving to the trailhead was a breeze, as the Squamish River road has seen lots of improvements in the last couple of months. Most of the potholes are now gone, and, apart from the last few kilometres of gravel, it was all new asphalt. The trail itself is well maintained and clearly marked. 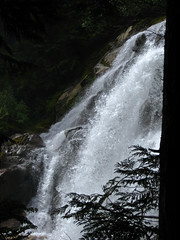 From the trailhead, it took us slightly over an hour to reach Crooked Falls. Even though the waterfalls have lost about half of the volume since May, they were still quite spectacular! After taking pictures of the waterfalls from different angles, we returned to the trail junction and proceeded along a fairly steep section of the main trail, just past the first viewpoint. Finally, the trail somewhat leveled up, as we reached another jucntion. We took the left fork (toward Ossa and Pelion) and proceeded along a somewhat marshy/wet area sprinkled with blueberries. As the trail approached the creek (shortly before the second viewpoint), we found a good spot for lunch right next to the cascades. Finally the trail leveled up as it reached the second view point (which we almost missed). Unfortunately, as we were proceeding further along the main trail we bumped into two wasp nests and all of us got stung. The first (larger) nest was about 10-15 min past the second viewpoint where the trail was crossing an open area densely overgrown with bushes and Devil’s Club plants. The second one was about 5 minutes further along the trail. Apparently the area is prone to wasps, as they were mentioned in a couple of older trip reports in 2005 and 2009. In this ordeal, everyone showed an enormous level of cooperation, as people were sharing their anti-histamine supplies and helping each other to inspect/remove the stings. Thank you Jaime, Katarina, Milie, Alice, Tu Loan, and Ellie, for keeping a cool head, you are awesome! The way down was somewhat slower than going up as many portions of the trail were fairly muddy and slippery. As the weather improved, we caught a decent view from the second lookouts. However the Pelion glacier has substantially receded since May and was barely visible.